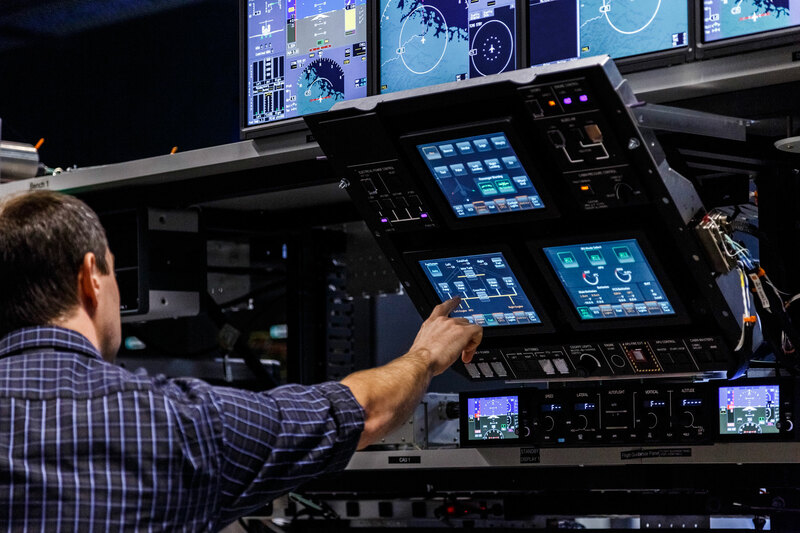 The G500 integration test facility features a flyable cockpit where pilots can test all of the new features, such as touchscreen-controlled avionics and the new active control sidesticks. Engineers can see exactly what pilots are doing on large-screen monitors that replicate cockpit displays. Last October’s simultaneous announcement and rollout of the G500 was a memorable milestone in a program that began many years earlier as the germ of an idea in the fertile minds of a group of forward-looking Gulfstream designers. Clearly there would be a hole in the Gulfstream lineup between the then-gestating G650 flagship and the mature G450 and G550. Various concepts winnowed through the process, and what became the G500 and G600 grew from a conceptual drawing to a new jet line that could be presented to potential buyers. Behind the scenes, it became a full-blown program that spread into almost every sector of Gulfstream’s far-flung operations, from company leadership and designers and engineers to production planners, test pilots, maintainers, marketers and suppliers–everyone involved in bringing a new airplane to life. With the G500/G600, Gulfstream is expanding its reach in the large-cabin, long-range market. The new jets aren’t just upgrades of existing models but are entirely new designs, with a new type certificate, Honeywell touchscreen-controlled Gulfstream Symmetry flight deck, GE Aviation digital data network, Pratt & Whitney Canada engines and electronically interconnected BAE sidesticks. Compared with the G450’s 4,350-nm and G550’s 6,750-nm range at Mach 0.80, the G500 promises 5,000 nm and the G600 6,200 nm at Mach 0.85. Interior cabin dimensions for the new jets, at 91 inches wide and 74 inches high, fit between those of the G450/G550 (84 and 72 inches) and G650 (98 and 75 inches). Maximum speed of the G500/G600 matches the Mach 0.925 of the G650, and at a relatively high-speed cruise of Mach 0.90, the G500 can fly 3,800 nm and the G600 4,800 nm. The G500 and G600 share manufacturing technology with the G650, such as more use of chemically milled aluminum skins and bonding of structural components, which makes construction more efficient; and the two model lines’ fly-by-wire flight control systems are essentially the same. As is typical with Gulfstream programs, the new jets incorporate what years of research and consulting with members of the company’s advanced-technology customer advisory team (Atcat) revealed as desirable characteristics. Touchscreen controls are no longer new in business aviation; Learjet, Cessna and Honda Aircraft have adopted these in Garmin-equipped jet cockpits, and Rockwell Collins has fielded the first touchscreen panel displays in a turboprop business aircraft, with its Pro Line Fusion King Air flight deck retrofit (also in the AW609 tiltrotor). Fly-by-wire is also established technology in business jets, not only in the G650 but also in Embraer’s Legacy 500/450 and Dassault’s Falcon 7X (the first fly-by-wire business jet) and upcoming 8X and 5X. The G650 retained the traditional yoke controls, however, while the Legacys and the Falcons employ sidesticks. When it came to designing the G500/G600 flight controls, Gulfstream engineers worked closely with BAE Systems, which had already fielded its active control sidesticks (ACS) in military aircraft. In the G650 and also Boeing fly-by-wire designs, the yokes move together just as in a non-fly-by-wire design, and they are “yoked” together by electromechanical machinery that adds weight and complexity but allows both pilots to perceive control movement not only visually but by feel too. Boeing has long held that this is why it has retained yokes, even in its most modern design, the 787. ACS works similarly but eliminates the complexity of yokes, which not only saves weight and allows pilots to see and feel control movement but also opens up the flight deck, as pilots of sidestick-controlled aircraft can attest. The new jets feature Pratt & Whitney Canada PW800 engines. The PW800 features a one-piece integrally bladed fan, which eliminates the traditional “clinking and clanking of the blades as the fans windmill,” Izzard said. The new fans are more damage tolerant and easier to repair, he added, and the PW800s have no mid-life major inspection interval and a 10,000-hour TBO. The engine manufacturer isn’t a new vendor for Gulfstream, which began a relationship with Pratt & Whitney Canada after Gulfstream acquired Galaxy Aerospace and the PWC-powered Galaxy became the G200. Also new is the jets’ GE Aviation data concentration & network (DCN), which consists of 14 routers communicating via an Ethernet-based network. Systems data runs on the DCN, and that data can be used anywhere it is needed–for example, synoptics information on cockpit displays, or data for systems controls, health and trend monitoring and so on. The big difference from previous designs is replacement of many boxes on the radio rack by 14 routers distributed throughout the airplane. This eliminates 200 to 300 pounds of components and wiring and adds valuable cabin volume. GE is also providing the jets’ advanced power management and advanced health management systems. The new jets are equipped with a Rockwell Collins head-up display for the left-seater, underscoring Gulfstream’s HUD-centric philosophy. The Kollsman EVS III has four times the resolution of the previous enhanced-vision system, basically moving the technology from standard to high-definition resolution. The EVS camera is now a single LRU mounted on top of the airplane, more in line with the pilots’ field of view. The sapphire lens of the single LRU version is what is looking outside; the EVS II camera on previous jets is mounted inside a housing with a window that the camera looks through, which means the camera is looking through two pieces of glass (the camera lens and the sapphire window on the EVS housing). The Atcat is a subset of Gulfstream’s customer advisory board and gets involved fairly early in the design process. The internal program that became the new jets was launched in 2009, according to Andy Slater, chief engineer for advanced aircraft programs. “It was designed with the voice of the customer,” he said. Part of embracing that voice was to invite Atcat members to visit the four operational systems labs used to develop the new jets. In the labs, more than 22,500 hours of testing have been logged since program inception. Before the new design’s particulars were fleshed out in the labs, Gulfstream designers put sophisticated aerodynamic tools to work. The aerodynamic analyses included extensive development testing at Boeing’s transonic wind tunnel. This was followed by placement of the final configuration into the cryogenic European Transonic Windtunnel in Köln, Germany, where liquid nitrogen injected into the airflow makes for more accurate simulation of high-lift and high-speed flight. Another model equipped with landing gear and flaps flew in an Onera wind tunnel in France, and this testing validated close-to-the-ground operations, including ground effect, according to Slater. Some airborne flight-test correlation was also done in a G650. “We invested heavily in high-performance computing clusters,” he said, “and a high degree of wind tunnel and flight correlation to make sure the computational fluid dynamics methods correlated.” This also forms the basis for the aerodynamics used in the lab models. During a visit to Gulfstream’s Savannah, Ga. campus in February, this AIN writer toured the four labs during a briefing on the G500/G600 program. I also entered Gulfstream’s 3-D Cave virtual environment while wearing stereoscopic glasses that allowed me to interact with some G500 innards. The virtual environment is used for design reviews and replaces wooden mockups, which can take weeks of work just to model one particular area. The G500/G600 integration test facility (ITF) and iron bird started running in 2013. The iron bird, as is typical for most aircraft programs, allows testing of major mechanical systems, flight controls and hydraulics integration. It is where physical hardware is installed in the same relative position as the real airplane and gets worked out extensively to find and fix any problems well ahead of first flight. The ITF for the G500/G600 replicates the cockpit and the cabin. Although these aren’t physically mated as they would be in the real airplane, they are near each other and connected electronically. “They are integrated the same as the airplane,” said Scott Evans, project pilot for advanced aircraft programs. Behind the cockpit portion of the ITF, the cockpit displays are replicated on large monitors so engineers can see exactly what pilots are viewing. The cockpit ITF is an excellent venue for testing functionality of the new features of the G500/G600, especially the touchscreen-controlled avionics and ergonomics of the sidestick controls and the repositioned cursor control devices. The CCDs were moved from the pilots’ side ledges to the center console to accommodate the sidesticks. The three Esterline Korry touchscreen-controlled overhead panels eliminated 45 percent of the circuit breakers, according to Evans. The replacement of 70 percent of the switches, circuit breakers and controls by the 11 touchscreen panels in the G500/G600 cockpit is helping Gulfstream achieve the target of about 10 minutes for cockpit preflight preparation activities, down from 17 minutes on legacy models. The Gulfstream touchscreens are resistive, which requires more finger pressure (at least 100 grams or three ounces) than typical consumer tablets or phones that have capacitive touchscreens. Actuation of the selected element occurs when the pilot lifts a finger off the screen. Engineers, including Evans, spent hours testing touchscreens while driving in a van on bumpy roads and airborne in turbulence to make sure the controllers were ergonomically as good as they could be in a variety of conditions. A handy notes page, accessed by swiping down to up, lets pilots write down clearances or other information. After touching any waypoint on a flight plan, the screen shows what the pilot can do with that waypoint–for example, building a hold on that waypoint, either published or custom. Gulfstream now designs and builds its own seats, and they are each trimmed differently for testing purposes. One test seat, for example, has a longer bottom cushion. “It feels good at first,” he said, “but there’s not as much lumbar support. We want it to be perfect.” Gulfstream employees participate in testing, which includes simulated flights of four to six hours in the ITF. Customers also visit to test cabin ITF features, such as the fold-down 32-inch monitor in the credenza or the single-pedestal club-seat table with one-hand operation and an infinite number of stops (instead of the typical three). The galley design owes much to influence from Atcat members, too. The coffee maker can be swapped out with a kettle. A 4-cu-ft real fridge is installed, as well as a microwave and convection oven and a large sink that can accommodate the plates that customers typically choose. A steam oven will be optional. The oval shape of the G500/G600 fuselage also allows for deeper cabinets and drawers. For medium- and high-risk testing, Gulfstream’s third-generation Conceptual Advanced Simulation Environment (Case III) is used for human-factors evaluations, fly-by-wire control law development and integration of the ACS. The Case III is equipped with FlightSafety International’s Vital 1100 visual display and real active sidesticks, touchscreen controllers and throttle quadrant. The systems integration bench lab represents the aircraft’s digital network and allows engineers to test data flows and also validate new software loads, before software is moved to the other labs. “This helps advance the DCN to the level of maturity needed for flight-test and entry into service,” said Evans. By February this year, seven Gulfstream test pilots were involved in the G500/G600 program, and the labs allowed them to become familiar with the new jets’ systems and practice flying in preparation for the flight-test program. The first G500 (T1) rolled out last October. Next in line is T2, which was in final assembly earlier this year, while T4 was undergoing wing-to-fuselage joining and systems integration. The G600 is slated to fly in 2017, with certification following in 2018 and entry into service in 2019. Critical design review on the G600 was completed in the fourth quarter last year. G500 T1 is at the flight-test center and has completed ground vibration and structural mode interactive testing and had all final upgrades installed; it should fly shortly, if it hasn’t already done so by the time this is published. Meanwhile a G500 structural test airframe (S72) and components are undergoing more testing. The first production G500 (P1) is under construction, preparing for certification in 2017 and entry into service in 2018.